Given patient study, the invitation to Leslie Roberts’s show of drawings and paintings could function like the legend on a map, offering the exhibition particulars in the form of a homespun graphic code. Eight years ago the artist began inventing visual corollaries for everyday information jotted in a small notebook, most often by systematically coloring in graph-paper squares. 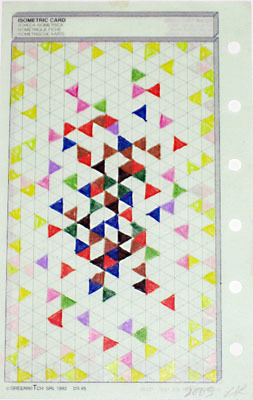 Many of her original Filofax pages are included here, and they evoke a wide array of reference points, from Eastern carpets to nautical flags to Xylor Jane’s obsessive, mathematically derived artworks. (The best, to my mind, is a confetti-like spray of brightly hued triangles that could fit in your pocket.) Most of Roberts’s paintings do not possess the tautness of the works literally hemmed in by the grid of graph paper, giving evidence to the fact that some of her compositions are derived intuitively. But when she devises a systemno matter what it consists of, as her written source and visual output have different relationships in different worksthe result is gratifying and intriguing, as if Vasarely had designed your Sunday Times crossword puzzle.